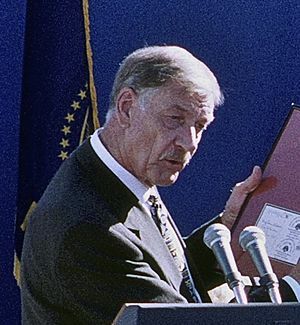 Gordon C. Faber (April 2, 1931 – August 18, 2014) was an American politician and businessman from the U.S. state of Oregon. He was born in Greensburg, Pennsylvania, he grew up in Hillsboro, Oregon. He joined the U.S. Air Force during the Korean War and was a small business owner before becoming a real estate agent and entering politics. He served on Hillsboro's budget committee and city council before serving two terms as mayor from 1993 to 2001. Faber died on August 18, 2014, at home in Hillsboro, Oregon at the age of 83 due to chronic obstructive pulmonary disease. Gordon Faber Facts for Kids. Kiddle Encyclopedia.